So first things first. What dish should I get? And then I found the IRC Channel called #hearsat in server StarChat ( irc.starchat.net ). So a lot of people actually helped me by giving me the information I need to take a decision over which dish antenna should I buy. 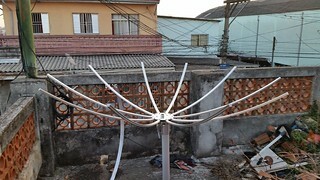 They were suggesting a 1.2m offset dish (same time of the Sky, Claro, and some other TV dishes, but bigger) for receiving GOES. Sadly I couldn’t find a offset dish bigger than 90 cm here. 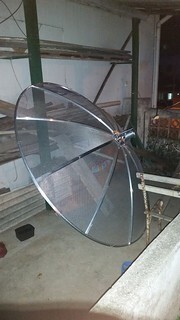 So someone suggested that I need at least 1.5m prime focus (the “old” type of TV dishes) that should have equivalent surface area than a 1.2m offset dish. So I went to Santa Efigenia Street (people from São Paulo will recognize) and went to Sat Imagem Store. Since my father and I was already friends with a seller, I asked what dishes they had to sell and said that I want something around 1.5m. He said that he has a 1.9m dish to sell. 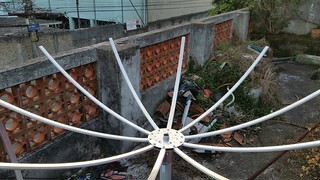 So I bought the dish, costed about R$200 (that’s about US$60) and also some cables and adapters. 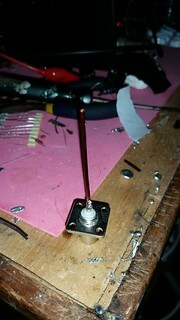 So since I was very excited to get things working, I asked my father’s help to assemble the antenna. 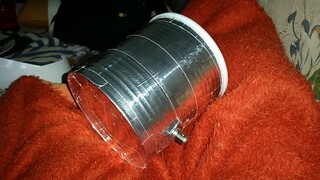 I arrived home about 5 PM so it was very late to assemble the antenna. So I let it for the day after. 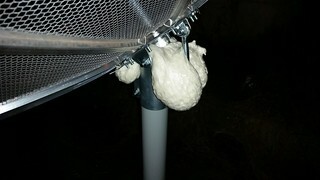 I also decided to inject Polyurethane Foam into the dish tube, so when it rains it doesn’t get filled with water. 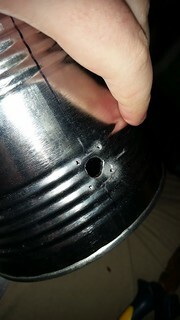 The only tip I have is: Be careful, your dish can grow balls. So the dish assemble is done. Now we need to worry about the feed. Keep your target frequency over TE11 and below TM01. The length of the can should be at least 0.75 * lambdag. Don’t worry if your can length is higher than that. Just try to keep close. 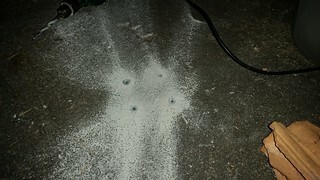 The probe length (linear feed) counts from the base of the connector (where you put the screws. 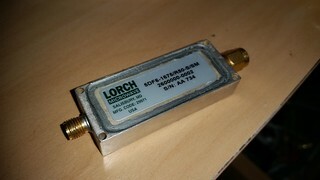 These waveguides usually have really wide bandwidth ( mine can probably get anything from TE11 to TM01 modes ). So the sizes are not that critical. Even so, I would keep the probe (the linear feed) length close to few mm of the lambda / 4 of the target frequency. 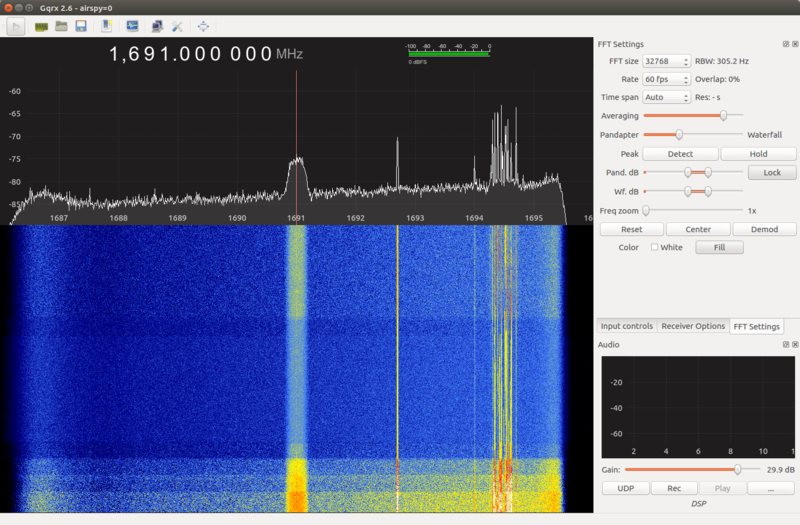 So in my failure setups I was having a REALLY huge noise from the GSM Band at 1800MHz. 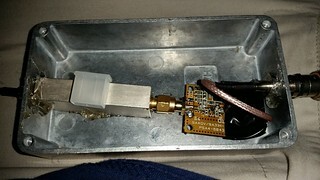 That was: even without any LNA I could get like 10dB of GSM signal. 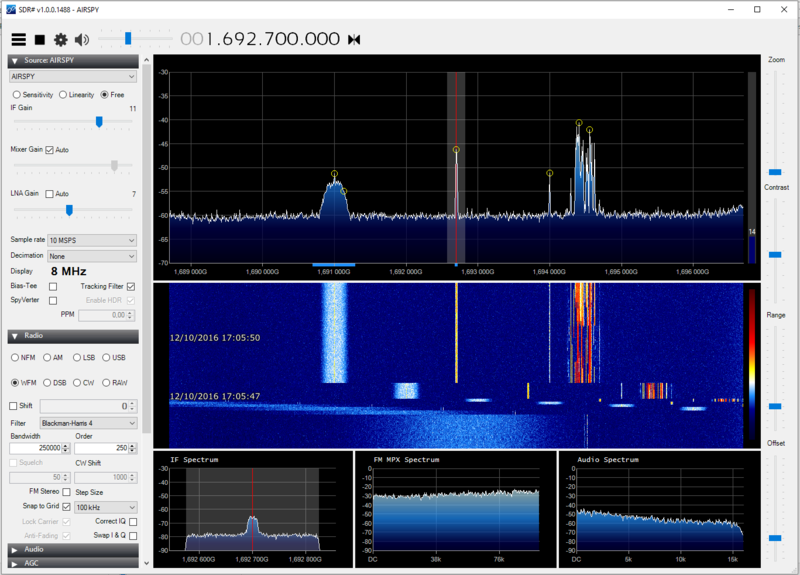 So mybit suggested me to use some filtering to wipe out this signal. 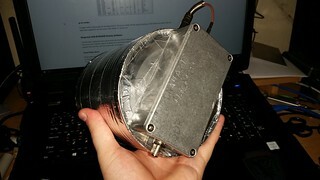 So I bought some Lorch Filters (recommeded and sold by him) that has a center frequency of 1675MHz and 150MHz bandwidth (so from 1600 to 1750 MHz). 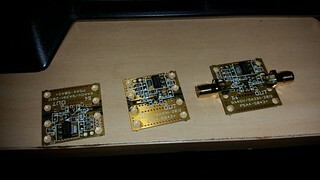 I also bought 3 LNA4ALL (one with connectors, two without) to use in this and other projects. 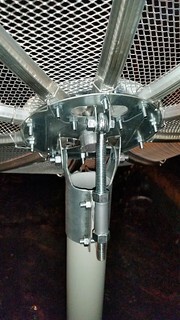 So the last thing was to position the antenna. I actually did this before the step of the feed (since I tested several other feed types). But if you’re planning to build everything this should be the order that you do the stuff. So in the past it would been tough to position an antenna, but today we have cellphones to help everything. One application I use in Android is Satellite AR. Another good one is Pointer Antena. Satellite AR has a preset list of Satellites (including GOES), and Pointer Antena allows you to fill with the coordinates of the satellite. Both are good and enough for positioning, just be carefull that your compass needs to be calibrated. Another solution would be use GPredict or Orbitron to get the Elevation (The inclination in relation to ground) and Azimuth (the bearing in relation to North) angles and position manually. 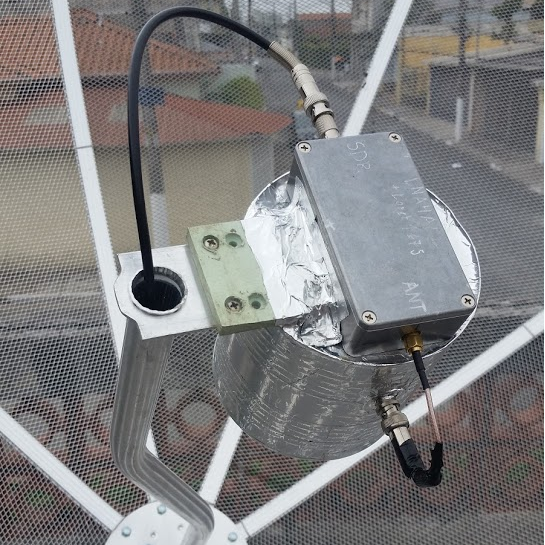 I noticed that for my dish there is a working band of about 4 degrees of Azimuth and Elevation that the signal doesn’t change. I would recommend get your laptop / cellphone and hookup to the feed and check where you get the best signal. So the next step is the whole decoding process. At the time of this writing I did not finish the whole demodulate -> decode process. For now I got the file output from GOES and need to decompress and convert the images, so I’m close. Once I finish, everything should be published in a Open Source License and I will create a new post here describing the whole process. Special Thanks to trango and mybit in #hearsat channel, for the help getting all of this to work.